With Israel in the forefront of renewable energy research, a conference next month at the Red Sea port of Eilat, the conference will provide new Israeli technology companies a platform to present their innovations. Some of the topics to be explored at the conference include: Renewable development in Israel, solar power, policies and regulations, and renewable energy technology. This year's Conference will include an additional track dedicated to the role of advanced energy-conservation technologies highlighting Israeli and other nation's contributions to the field of green building science and carbon reduction. The European Commission, the executive arm of the European Union, has chosen the Eilat-Eilot Conference for inclusion in the Commission's ECO4B initiative, a select project led by the Enterprise Europe Network which will invest €250,000 in renewable energy conferences taking place over 2010-2011. "We are thrilled to have been selected by the European Commission and to be included among Europe's most exciting renewable energy initiatives," said the representative of the Hevel Eilot Regional Council. "This grant highlights the leading role that Israel is taking in the global quest for a sustainable future and underscores the great value that the Commission places in Israel’s development of clean energy technologies." The 2010 Conference in Eilat will include the unveiling of a proposed model for dealing with the energy crisis through the promotion of the key elements required by developed nations to shape a sustainable energy future. These include raising awareness and education, research and development, the commercialization of technology, production of energy from renewable resources, energy conservation and supportive regulation. Additionally, the conference will serve as the launch of the bidding process for the planned 200 MW Timna Renewable Energy Park, the centerpiece of the Eilat-Eilot region’s efforts to turn Southern Israel into the "Silicon Valley" of renewable energy. Companies from around the world are expected to submit bids to purchase the first plots of land in the park and will then begin construction of the first projects in the park - two 50MW solar thermal fields. In addition to solar thermal, the park will feature a combined wind/solar "farm"; a solarized turbine pilot plant and the production of bio-gas from municipal waste. Is the Haiti operation coming to a Close? Today, Sunday (January 24), Israel will conduct a status assessment regarding the IDF's future activity in Haiti. 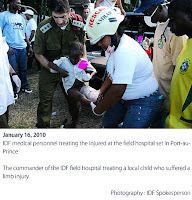 The Israeli field hospital was established in order to provide a first response to the citizens of Haiti until the arrival of additional medical forces capable of dealing with the magnitude of the situation. With the presence of American airplanes which brought with them equipment to build another hospital in Haiti, along with additional medical centers which have opened in the disaster zone, the activities of the Israeli field hospital will come to a close. However, IDF will remain in the country for as long as it is needed there and will provide assistance and support in various ways to the local population. The delegation has begun, as part of a broad international effort, to bring hundreds of thousands of Port-au-Prince residents to tent cities outside of the capital. Three water towers with a capacity of up to 12,000 liters of water each, were built by the delegation's representatives in order to supply the residents with a water infrastructure. Shelters and tents have also been constructed in order to provide refuge for those who have lost their homes. Israeli civil engineers also opened central traffic routes that had been blocked in the aftermath of the earthquake. In addition, help is being offered to other teams to help them be effective. - The Colombian surgical team had the necessary equipment and asked to deploy next to Israel's hospital and to be part of the hospital. - 20 British doctors and nurses asked to work with the Israelis. This is the same Britain that represents the so-called enlightened Europe, constantly criticising Israel. - the Russian delegation asked for Israeli assistance to power medical equipment. The team is giving full equality to all patients being treated. Haiti was a slave state and today there are terrible social gaps between the rich and the elite. In the present circumstances, this counts for nothing and the group of the poorest of the poor world are being treated the same as any other group. The IDF Medical and Rescue Team has arrived in Haiti, set up a field hospital in Port-Au-Prince and is beginning to treat patients there. In addition, the forces are locating and rescuing survivors trapped in ruined buildings, including many who were injured during the collapse of the UN headquarters. The field hospital is prepared to receive dozens of ambulances evacuating injured children from the different disaster struck areas. Between Friday night and Saturday, dozens of truckloads of medical and logistical equipment were unloaded and the field hospital set up. The Israeli delegation landed in the capital of Port-Au-Prince yesterday evening and has located itself in a soccer field near the air port. Upon arrival, C4I teams deployed communications infrastructure in preparations for the hospital's establishment. 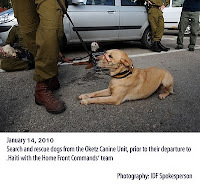 Two teams, comprised of search and rescue personnel and canine operators from the IDF canine unit were sent out on rescue missions. The first team was sent to the Haiti UN headquarters in order to assist in rescuing survivors. The rescue teams are working in cooperation with local authorities in order to reach disaster struck areas where survivors can be located and assisted. The delegation is scheduled to stay in Haiti for a minimum of two weeks. Further stay will be assessed at the end of this period. To get photographs of IDF operating in Haiti, go to: www.idfspokesperson.com. 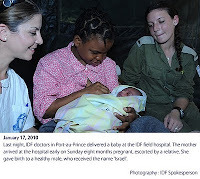 Israelis Save Lives; Deliver New Baby at Israeli Field Hospital in Haiti. The six man ZAKA delegation (four from Israel and two from Mexico) had arrived in Haiti aboard a Mexican air force Hercules, immediately after completing their work in recovery and identification in the Mexico City helicopter crash. On arrival, the ZAKA delegation was dispatched to the collapsed 8-storey university building where cries could be heard from the trapped students. After 38 hours of work around the clock working with the Mexican military delegation and otehr Jewish volunteers from Mexico, the ZAKA volunteers succeeded Saturday in pulling eight students alive from the rubble. Amid the stench and chaos, the ZAKA delegation took time out to recite Shabbat prayers - a surreal sight of ultra-orthodox men wrapped in prayer shawls standing on the collapsed buildings. Many locals sat quietly in the rubble, staring at the men as they prayed facing Jerusalem. At the end of the prayers, they crowded around the delegation and kissed the prayer shawls. Just minutes after landing in the airport in Port-au-Prince the IsraAID team was met by David Darg, Operation Blessing Director in the field and his staff and joined with them to unload a planeload of food and medical equipment. The Israeli medical professionals of IsraAID - F.I.R.S.T. traveled to the main Port-au-prince Hospital to start treating patients, joining local physicians at the site of the collapsed central hospital where thousands of wounded have gathered desperate for help. "The scenes in the hospital were horrible we saw people everywhere on the floors in the building and outside, people with amputations and bone-deep wounds, hundreds of them, the size of the catastrophe is unbelievable. All of the injured were treated until we came by only one local doctor and we were the first foreign backup team to operate in the hospital." Said Nurse Sheva Cohen from Kibbutz Ein Yahav in the Negev. When the team arrived at the hospital they found most of the injured outside the building laying in beds in the building's garden, probably out of fear of aftershocks and further collapse. The IsraAID team set up treatment rooms in four empty rooms, treating 60 patients with IV and administered medicine. While in the hospital, an infant with 60% burns died and bodies that had not yet been removed for burial were piled up in back. In the meantime, the logistical personnel remain in the airport area to set up camp and assist local NGO partners with logistical support for relief items that were continuing to land. Currently the teams are working around the clock to provide assistance to the injured. In light of the scale of the disaster, IsraAID is currently focused on expanding the scale of its operation, preparing an additional team that would be sent next week. One particular story stands out as an example of how the Circle of International Health (COHI) team has dramatically impacted the life of one of the women. Teresa, a Sudanese woman from the Dinka tribe, was sent to the shelter from prison where she and her two year old child had spent a number of months. She was thin for someone who was already in her seventh month and seemed very much under stress as she was worried that her husband was not being released from prison. Soon after she arrived, the COHI volunteers began their visits to the shelter. Teresa was examined and they detected some minor swelling in her ankles—a sign of possible edema. A few days later, Teresa complained that she was not feeling well. After taking her blood pressure which was extremely high, sent her immediately to the hospital. Clearly the advice to send her to hospital may have saved Teresa's life as she was experiencing preeclampsia and the doctors said that had she arrived any later, her condition would have been critical. The doctors agreed to give her the opportunity to have a natural birth. Unfortunately, as Teresa was brought into the labor room a volunteer came to the rescue to sit with Teresa during the labor. Amazingly the contractions began to speed up and she dilated quickly. Several more babies have been born since that time and the shelter has been more than grateful that COHI has expanded its services for us—supplying doulas at birth, finding gynecologists to assist in pre-natal care, walking through a multitude of needs specific to each woman, providing counselors to help with breastfeeding. The level of compassion and concern displayed by the COHI team is tremendous. Recently, we had a heartbreaking situation where the husband of one of the refugees died in her arms while crossing the desert. The volunteers od COHI identified some very deep problems in this woman and we were able to act accordingly. Truly they give more than just medical expertise; COHI as exemplified by the team in Israel give fully of themselves to this work and to the women they serve. A HUGE thank you to all who make this possible. There are only 1.98 hospital beds per 1,000 residents, compared to 8.2 in Japan and 5.7 in Germany, the report states. Whilst the low number of beds is of concern, I do wonder if the level of preventative medicine here in Israel results in the need for less beds than other countries around the world. When I talk to friends from overseas about my own personal examples of preventative procedures that I can undergo as part of my national health plan coverage, they are often agog. The highly developed preventative procedures certainly reduce the need for beds, perhaps not as low as we have but not as high as Germany or Japan. Now, this month comes the news that Bar-Ilan University will be the home of Israel's newest medical school. The Council for Higher Education selected the University to launch the much-needed school, which will be located in the northern Galilee town of Safed. Bar-Ilan University will establish a leading faculty of medicine integrating cutting-edge research similar to that conducted in the world's top medical schools. The medical school complex will include a state-of-the-art facility which will house 40 medical research teams and absorb returning Israeli scientists. The solution is designed to seal leaks fast, with little inconvenience to the customer. Most kids know that some little pigs ate roast beef, some stayed home and some had none. Today, some new little pigs from Israel are going out to fix pipes - tackling a billion dollar problem in the world's water, gas and oil industry. Curapipe, on Israel's southern coast in Ashkelon, has a new solution that can detect and repair a problem that hides below the radar of the water and gas industries. Tiny pinhole, almost undetectable leaks emit water, oil and natural gas, costing the taxpayer money and causing unnecessary greenhouse gas emissions to enter our atmosphere. Water is energy, yet the background leakage in city water pipes is so extensive that the World Bank estimates that about 88 billion liters of water is lost through urban pipes every day - in both rich countries like America and poorer ones where every drop counts. Rather than overhaul existing infrastructure to replace new pipes, water management bodies accept this as unavoidable loss, and deal with tiny cracks in the pipes by reducing water pressure. At some point, however, this approach won't work anymore, and expensive repairs will need to be done. Curapipe's cost-effective solution can seal leaks fast, with little inconvenience to the customer. The company has developed a solution based on an existing method to clean water mains: Small spongy objects referred to as 'pigs.' Water maintenance teams suspend the water supply for a couple of hours while the 'pig' is pushed through the system using water pressure. As the pigs are propelled through the pipes they remove scale and other types of unwanted buildup. The pigs can do their work in pipes made of lead, cast iron and even concrete. Curapipe has found a way to "piggyback" on this system. It has developed a device that employs two pigs with a sealant material held between them. Pushed through the water pipes in the normal way, when the pigs encounter a crack or a leak, a composite material is squirted out to fill it in. The material then hardens in place. Once the pipe has been flushed with water to clean it, it returns to normal usage. Curapipe is based in one of the many incubator around the country, with funding from the Office of the Chief Scientist in Israel, the company is looking for a $2 million investment to take their little pigs to market. The pigs will be ready for action in mid-2010 and by 2011 they should be on the market in the US and other countries. Curapipe is now working with the Eilat Ashkelon Pipeline Company, Israel's major oil pipeline company, to test the pigs in both water pipes and oil pipes. The solution could also prevent devastating leaks and oil spills in nature. A solution for oil leaks will have to wait awhile, because of the "crucial situation in the water industry," says the CEO, but thanks to Curapipe's pigs you can expect fewer neighborhood streets to be dug up in the meantime. The link below is to a 6 minute video about the creation of 'Clown Doctors'. It relates the wonderful things they are doing as part of the medical team in children’s hospitals throughout Israel and is really something special! Israel. So often the trailblazer for good, has taken a poignant and unique idea to a powerful new level. Imagine a Bachelor of Arts in ‘Clowning’? Yes, it is now a reality at Haifa University and now they are now working on a ‘Masters Degree’! One of my grandsons used his summer holidays to take a course in this field (not at the degree level) which allowed him to undertake certain activities in the hospital environment. During the last decade, there was a significant growth in the rural tourism and zimmers (rural accommodation) industries. According to statistics, this industry is worth about 1 billion shekel a year. There are about 9,000 zimmers in Israel which mainly attract domestic tourism during weekends, holidays and vacations and therefore result in an annual occupancy rate of 38%. As part of the Ministry for the Development of the Negev and Galilee's policy to develop and bring prosperity to the periphery, a need was identified to exploit the potential of rural accommodation both for domestic and incoming tourism and, as a result, the IBB initiative was developed, a grading system that facilitated for the first time an address for inquiries and an answer for every tourist wishing to stay in zimmers. The IBB grading system checks 140 different criteria in line with international norms and grades the rooms according to standards A, B and C that determine the levels of quality and service. The criteria include, among others, type of mattress/pillow; cleaning in non-conventional areas; distance of zimmer from chicken coop or cow shed; size of room; noise from the air conditioning; credible advertising/price correspondence. The zimmer owners participate in a workshop and the rooms are checked by a consultant working on behalf of the Tourism Ministry. At the end of the process, they connect to an internet system that synchronizes online reservations (it is possible to see which zimmers are available) alongside the zimmer grading, price per night, nearby attractions and more. A sign bearing the zimmer grading is places on the zimmer door. From a letter received recently comes interesting factual details of the casualties in the Gaza operation. It's been alleged that most of the people killed in Gaza during last year's operation "Cast Lead" were civilians. Their names were published by the Palestinian Center for Human Rights. At the same time, the Hammas published a list of its fighters killed during the operation. It turns out that a lot of the names refer to the same people – i.e. – the alleged civilians were in fact terrorists. A link http://hosem.org.il/ye (English) actually shows these terrorists which had been listed as civilians.